We are proud to be the first to showcase a new and exciting salsa band -- La Circunstancia -- co-led by veteran bassist Joe Santiago and trombonist / arranger Doug Beavers. The original tune that they performed at the LP® studio was a danzon / cha cha cha called "La Circunstancia." The tune had a very old style and swing, almost reminiscent of the Palladium days. Written by Francisco "Pancho" Fellove, the song was performed by some of the most talented musicians in New York today. 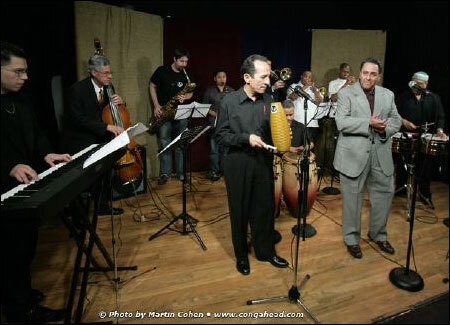 The band consisted of Doug Beavers on trombone, Joe Santiago on bass, Chembo Corniel on congas, Jose Grajales on timbales, Yeissonn Vellamir on piano, Steven Oquendo on trumpet, Bruce Harris on trumpet, Matt Cowan on baritone sax, Jon Irabagon on alto sax, Karen Joseph on flute, and singers Hector Aponte & Jorge Maldonado.